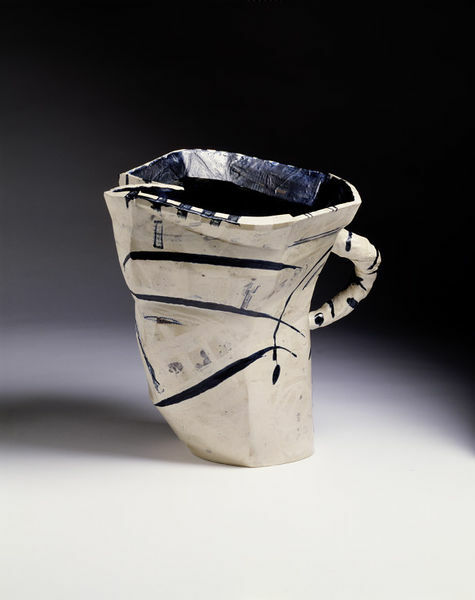 Alison Britton's expressive surfaces relate to modern painting, but her work is also deeply informed by ceramic history. 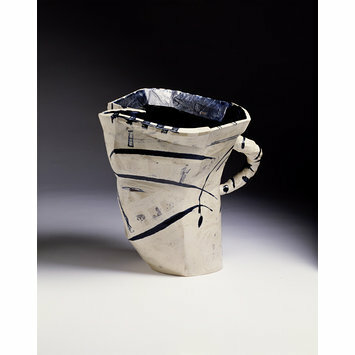 This jug is decorated in classical blue and white, and its twisted handle is inspired by traditional 'crabstock' handles. Jugs are normally functional objects, but here the unexpectedly inverted spout defies use, provoking us to question our assumptions about craft and function. Handbuilt jug with painted decoration in blue on a cream slip. Handbuilt earthenware jug with blue and white decoration, Alison Britton, 1987.